J. Bot. 66: 15 (1928). Origin and Habitat: Aloe pillansii is confined to a small region of less than 200 square kilometers in north-western South Africa (the Richtersveld) and southwestern Namibia. There are probably fewer than 5,000 individuals (adult less than 200) of this species alive today, and distinct populations may be composed of only a few individuals. Habitat and ecology: It grows primarily in hot, arid, stony hillsides almost devoid of soil in succulent karoo at low altitude in the winter rainfall region (annual rainfall is generally below 100 millimeters). 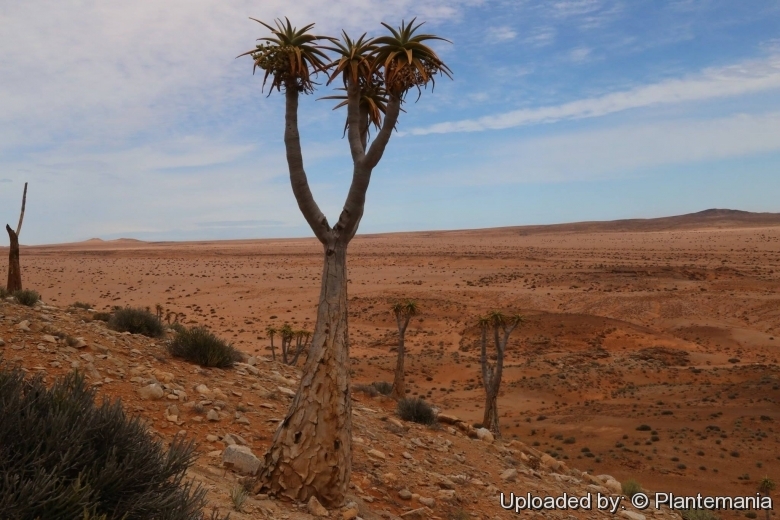 The continued survival of Aloe pillansii in the Richtersveld is threatened by the poor survival of seedlings and young plants. The reasons for this are not completely understood, but one of the contributing causes is overgrazing by itinerant herds of goats and donkeys, which destroys the seedlings. No recruitment has been recorded in any of the main sub-populations and older plants are dying. It has been suggested that this species, along with Aloe dichotoma and Pachypodium namaquanum, represents a keystone in the ecosystem, being one of the few perennial plants able to tolerate the conditions. In Namibia it seems to be an indicator of heavy-metal soils. It is an important source of shelter, nectar, food and moisture, especially to the avifauna. The broadly similar arborescent desert aloes Aloe dichotoma is widely distributed in the arid and semiarid winter and summer rainfall regions of the western part of South Africa and Namibia over an area of more than 500,000 square kilometers. Aloidendron pillansii (L.Guthrie) Klopper & Gideon F.Sm. Description: The Giant Quiver Tree, Aloe pillansii, is a stately tree aloe that can grow in the shape of a sparingly-branched candelabra up to 10-12 metres high in habitat (but likely much smaller in cultivation) and can live to be hundreds of years old. The trunk is thick smooth sparingly-branched tipped with rosettes of only a few fat short slightly-arching silver-gray leaves. Aloe pillansii trees are very slow growing and revealed a mean annual growth rate of about only1 cm, however, the growth rate of oung individuals less than 1 meter, is nearly 2.5 times faster and it takes between 50 and 75 years for an individual to reach between 2 and 3 meters in height. Derivation of specific name: It was named after the South African botanist Neville Stuart Pillans. 1884-1964. who first collected in October 1926. on Cornell's Kop, in Richtersvcld, Little Namaqualand. Stem: Up to 10 m or more tall, trunk 1 - 2 m in diameter at base, narrowing to about 20 cm above, dichotomously branching from the middle upwards. Leaves: Many per rosette, lanceolate-attenuate, slightly falcate, (35-)50-60 long, 10-12 cm broad, shallowly biconvex to shallowly channelled, grey-green to brownish-green, with white margin, surface smooth. Marginal teeth 1-2 mm long, white, 5-8 mm apart. Inflorescences: Lateral, pendent, emerging from the axils of the lowest leaves, about 50 cm long, spreading horizontally with racemes turning up-wards, with up to 50 branches. Racemes cylindrical, to 15 cm long, oblique to erect, lax to subdense about 30-flowered. Bracts filiform, 3-6 mm long. Pedicels 7-15 mm long. Flowers: Lemon-yellow to butter-yellow, pendant, 25-35 mm long, base attenuate, c. 12 mm jin diameter. Ovary 6-7 x 2-6 mm, pale green slightly narrowing above to mouth. Outer segments connate for 7-10 mm, inner segments free for 25 mm long. Stamens exserted 10 mm. Style exserted 12-20 mm. Blooming season (in habitat): Mid-spring (September-October). Seldom seen flowering in cultivation. Fruits: 24-50 mm long, 18-25 mm wide, pale buff. Seeds: Buff, c. 14 x 7 x 2 mm, including a broad wing. Similar species: Aloe pillansii is a rare species, closely related to the common Quiver Tree, Aloe dichotoma, but is easily distinguished by its fewer erect branches. The leaves are much larger than in A. dichotoma, have large, whitish thorns (as opposed to small, yellow thorns in A. dichotoma) that fully encircle the branches of the tree. It is also distinguished by its inflorescence which is produced laterally and hangs downwards among the lowest leaves (while A. dichotoma has upright inflorescences), the racemes of yellow flowers turning upwards. This is regarded as one of the largest of South Africa's tree aloes though it is rarely seen to any great height in cultivation. Only the more common Tree Aloe, Aloe barberae gets taller and more massive. 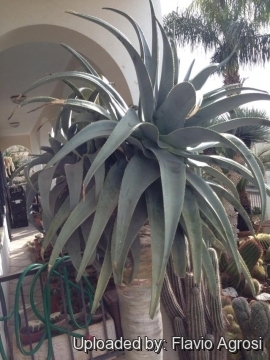 11) San Marcos Growers contributors “Aloe pillansii - Giant Quiver Tree” San Marcos Growers <http://www.smgrowers.com>. Web. 27 Sep. 2014. 16) Wikipedia contributors. "Aloe pillansii." Wikipedia, The Free Encyclopedia. Wikipedia, The Free Encyclopedia, 29 Oct. 2014. Web. 14 Dec. 2014. 18) Gideon F. Smith, Colin C. Walker, Estrela Figueiredo: “What’s in a name: epithets in Aloe L. (Asphodelaceae) and what to call the next new species.” In: Bradleya. 28: 87 2010. 19) Hilton-Taylor, C. 1998. “Aloe pillansii.” The IUCN Red List of Threatened Species. Version 2014.3. <www.iucnredlist.org>. Downloaded on 14 December 2014. 21) Moran, R. “Aloe wild in California.” Cact. Succ. J. (Los Angeles) 64: 55-56. 1992. Cultivation and Propagation: Aloe pillansii is an attractive and interesting accent plant to have in a sunny garden. It very rare but easy to grow and suited for any well drained soil in full sun. Growing rate: It is very slow growing, but should be well watered and enough compost provided for optimal growth. It is able to increase its height by 3 cm per year under favourable conditions. It is a long lived plant and once established, it will be content in its position and with its soil for years. It is often in danger of being overgrown, smothered and killed by faster growing plants in its vicinity. Soil: Always use a good quality, loamy sandy soil with plenty of drainage chips at the bottom of containers. It prefers soil of a medium or slightly acidic pH. Outdoors always provide a well-drained site, on a slope is best. Enough space should be provided for its eventual size. Exposure: Full sun. It can tolerate moderate shade, and a plant that has been growing in shade should be slowly hardened off before placing it in full sun as the plant will be severely scorched if moved too suddenly from shade into sun. Pest & diseases: Incorrect watering, poor drainage or too much shade can lead to attack by pests and diseases. Rot it is only a minor problem with aloes if the plants are watered and “aired” correctly. If they are not, fungicides won't help all that much. The leaves may be attacked by aphids and scale insects, which are controlled with an oil-based spray. Hardiness: It is sensitive to frost and in a frost-prone area should be protected in the first few years of its life, but prefers hot summers. It grows much better outdoors in spring and summer. Gardening and landscaping: In mild climates it can be cultivated outdoors for use in landscaping, preferably planting it in hot and dry rock gardens. It forms a striking focal point in the garden, being an enormous sculptural tree with a neat crown. It will grow best in regions with a climate close to that of its native deserts – not too cold, and not too wet. Due to its massive stem base, it should preferably not be planted close to any buildings. It can be grown in large containers too.